Hey ladies and gentlemen and skincare fanatics alike! If you have been following me on Instagram for a while, you may have noticed that I shared my excitement in trying Juice Beauty Organic Skincare products for the first time some months back. 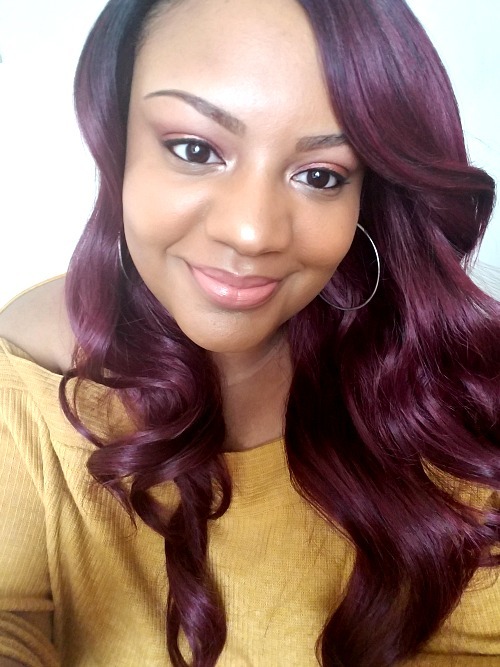 And since I have been using these products for quite a while now, I decided it would be a good time to share the results I have gotten from trying the Juice Beauty line with you guys. 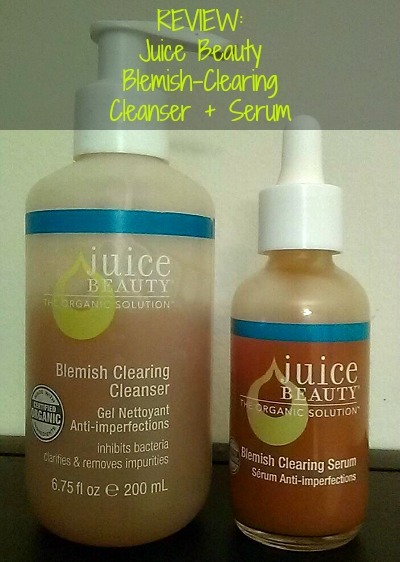 When assessing my skin care needs at the time of purchasing these products, I wanted to bring radiance to my dull skin and lighten my hyperpigmentation without using anything harsh, so I chose the Juice Beauty Blemish-Clearing Cleanser and the Juice Beauty Blemish-Clearing Serum. Juice Beauty Organic Skincare Line Overview: Founded in California by Karen Behnke and Melissa Jochim, Juice Beauty was created to make healthy, organic, and effective beauty products available to the public. Using a 100% certified organic juice base rather than a water base these products have a total organic content up to 98% in every product. Packaging- the pump dispenser was the first thing I noticed about this cleanser. I like this, because it allows one to dispense just enough product with a couple of light pumps. I don't, however, like that I cannot travel with this bottle. I've been doing a lot of back and forth lately and it would have been nice if a cap came with the product also. Scent- This cleanser has a scent similar to that of apple cider vinegar or household cleaner or something. Though the scent is not strong or overpowering, I did have a slight aversion to it during my first trimester. The smell is probably due to the organic juices in the ingredients. Price- Juice Beauty Blemish-Clearing Cleanser is not a product that I would call cheap. In fact, this product costs $21.80, more than I've paid for other cleansers in the past. The fact that this product is organic, however, really made me feel like the price I paid for this product would be worth it. Especially since I looked forward to using something "pure" on my hormonal pregnant lady skin. As the instructions call to apply morning and evening to damp skin in a circular motion, I did so using my Olay Professional Pro-X Cleansing Brush I purchased last year. The cleanser is a gel formula, so I was not sure how well it would cleanse my skin. I suppose I'm so used to seeing lather and equating that with a deep cleansing. To my surprise, the Juice Beauty Blemish-Clearing Cleanser left my skin feeling so clean and refreshed! Juice Beauty Blemish-Clearing Cleanser is formulated to clarify, inhibit bacteria, remove impurities, prevent blemishes, and hydrate the skin. I've been using it for the last 3-4 months and I must say I haven't had any breakouts while using it nor have I experienced any dryness. What I like the most about this product is the fact that it's organic. Since I'm pregnant, my skin is more sensitive now than it has ever been before and it feels great to know that I'm not putting anything harmful on my skin. And though this is probably the most I've ever spent on a cleanser, it lasts for a long time! 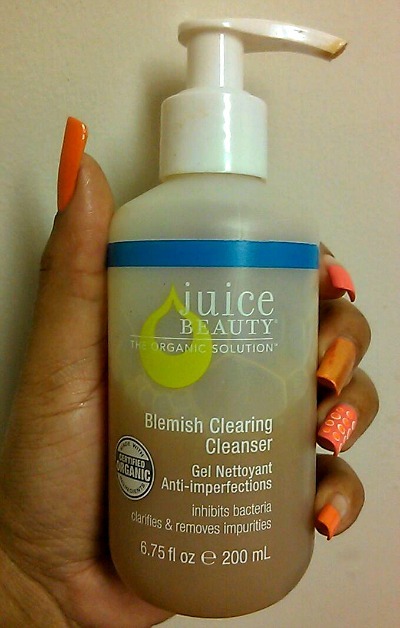 Overall, I think Juice Beauty Blemish-Clearing Cleanser makes for a great basic cleanser for those with sensitive skin. Packaging- I like the packaging of this serum much more than I do the cleanser. In fact, I think it's ideal for a serum. It has a twist-top with a dropper attached, so that one is able to dispense as little or as much product as one needs. Scent- This serum, unlike the cleanser, has a refreshing citrus smell. I like it! 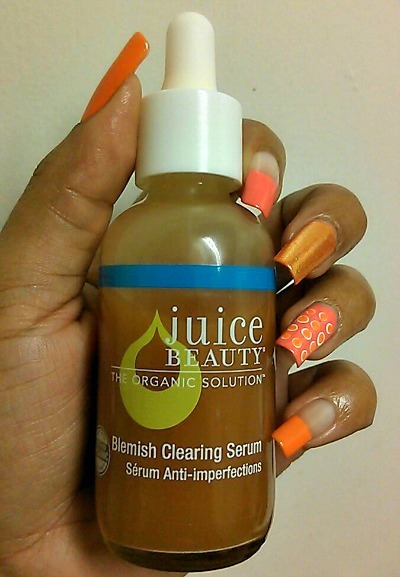 Price- The Juice Beauty Blemish-Clearing Serum is $29 for 2 oz. Again, while the price of this product is higher than I would normally pay, it is a lot of product in the bottle. And I have no problem spending more money for a product with quality ingredients. As the instructions suggest, I used the Juice Beauty Blemish-Clearing Serum morning and night after cleanser and before moisturizer. Now the key to using this product is making sure you apply an oil-free moisturizer afterwards--otherwise you will be looking like an oil-slick! At first, I was applying the serum all over my face twice daily. But after feeling a bit greasy in the mornings when I woke up and as the day progressed, I decided to just use it as a spot-treatment under my moisturizer. Juice Beauty Blemish-Clearing Serum is formulated to reduce breakouts, lighten scars, and renew skin for a fresher, clearer complexion. These three things are always the top things I look for in skin care, so I was pleased to see that this product did its job! My skin feels smoother and I've only had one pimple in several months. My scarring has even lightened a bit (though it did take time to see results). I didn't even realize it until I noticed I haven't had to wear full-coverage foundation in a while. One main thing I like about this product is I didn't experience any tightness or stinging while using it, as I have with other serums in the past. Like the cleanser, this serum is very gentle. Have you tried the Juice Beauty skincare line? I highly recommend these products for those of you looking for skincare made with organic products and may have sensitive skin. These products were purchased with a gift card I received from SkinCareRX in sponsorship. 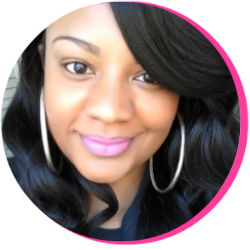 I had the freedom to choose whatever product I desired and was under no obligation to purchase or review any items. The content and opinions expressed here are all my own.